Great summer weather is another kid-friendly aspect to living in Lake Oswego. 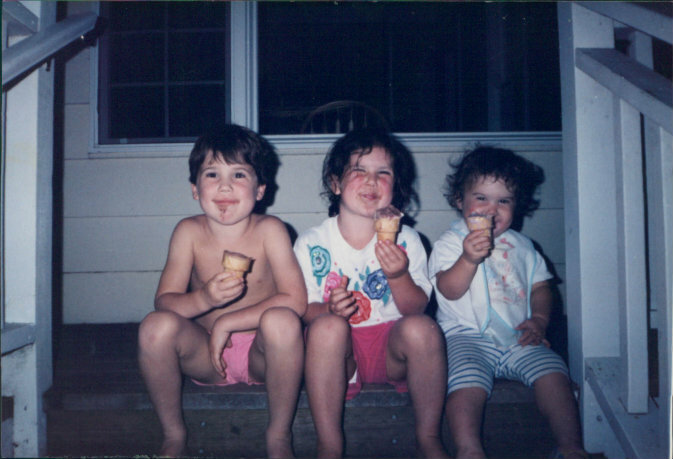 It gave my kids plenty of excuses to just sit on the porch and enjoy ice cream cones. Over the course of my 25 plus years selling real estate in Lake Oswego, I’ve worked with many clients who are looking to move to our town because they’ve heard it’s a good place to raise a family. Three kids later I have to concur. In fact, just this summer, all three of mine fantasized about how they’d all move back to Lake Oswego when it’s time to have kids and live on the same street. That speaks to the good memories they have growing up here and judging by this lineup of summer offerings, you can see why. 1. Movies in the Park. Grab your blankets, pillows and low sand chairs and bring the kids to Millennium Plaza Park on Thursday evenings for the next four weeks for family-friendly movies. The lineup includes Super Buddies (July 24), Despicable Me 2 (July 31), The Karate Kid (August 7), and The Lego Movie (August 14). Movies begin at dusk. First and Evergreen. 503.675.2549. 2. Swim Parks. The Lake Oswego Swim Park at 250 Ridgeway Road is open to all Lake Oswego residents at no charge from July 1 through August 31, 1:00 p.m. to 6:00 p.m. 503.953.9325. The Lake Grove Swim Park at 3800 Lakeview Boulevard is open to residents within the original Lake Grove School District boundaries free of charge from 12:00 noon until 8:00 p.m. through Labor Day. 503.635.0356. 3. Masque Alfresco. Let the laughs begin as slapstick antics infuse Molière’s The Would-Be Gentleman for the whole family to enjoy. 7:00 p.m. Friday-Sunday through August 3 in front of the Iron Foundry at George Rogers Park, 611 S. State Street. 503.254.5104. 4. Library programs. From Wii gaming sessions to magic shows, the Lake Oswego Public Library has ramped up its programming to make sure kids in Lake Oswego have something to do. Check out their schedule. 5. Summer Camps. The Lake Oswego Parks and Recreation Department has tried to schedule something for everyone from Dancing Princesses Camp to Rocket Labs to Food Around the World. Check out their full listing. 6. Learn to Skate Night. Let LO Skate Park instructors give your child (ages 5-15) a mini-lesson for beginners and intermediates. Register for Course #3411041. Fee is $4. 5520 Willow Road. 7. Child Safety Seat Clinic. It’s not all about having fun—it’s about being safe too. Find out the proper way to install your safety seat. 10:00 a.m. to 1:30 p.m. at the main fire station, 300 B Avenue. 503.635.0275. 8. Rox in Sox Children’s Music and Book Festival. This is the music festival for the young set featuring entertainment by Aaron Nigel Smith and the One World Chorus as well as the School of Rock and others. Authors include Valerie Pearce and Philip Pelletier and be prepared for a guest appearance by Blaze the Trail Cat! Saturday, August 2 from 10:00 a.m. to 2:00 p.m. West End Building lawn, 4101 Kruse Way. 9. All Comers Track Meet. On your mark, get set, head over to the Lake Oswego High School Track on Wednesday, July 23 for a lineup of events your whole family can participate in. Registration at 5:15; events begin at 6:00 p.m. 2501 Country Club Road. $3 youth/$4 adults. 10. Calling All Teens. While teens are welcome at many of the above events, they might be especially interested in the lineup of volunteer/adventure activities available through the LO Teen Service Corps, as well as library programming that includes a Teen Drawing Class (from 10:00 a.m. to 12:00 noon on July 24). Don’t miss out on what there is to love about Lake Oswego Oregon! Sign up for weekly updates by clicking on the “Sign me up” button in the top right hand column. This entry was posted in Things to Do in Lake Oswego and tagged Family friendly activities in Lake Oswego Oregon, Lake Oswego Oregon, Summer in Lake Oswego Oregon, Things for kids to do in the summer in Lake Oswego Oregon. Bookmark the permalink.